Each year as cold weather approaches, MFS faces our biggest expense yet: we desperately need to purchase hay and shavings to see our animals through the winter months. We're seeking to raise $20,000 by the end of the year to help purchase three trailer loads of hay and one trailer load of shavings. 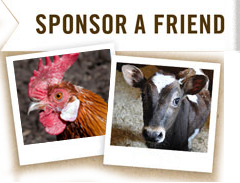 Please help by making a gift to our winter hay campaign! We've put up a special donor recognition tree at the sanctuary, and when you make your gift, we'll add an ornament with your name to the tree. We are also happy to provide additional rewards, including a birdseed ornament, MFS socks, and MFS t-shirt, and tour tickets. Please spread the word about this crucial campaign by sharing it on social media. The more people we reach, the closer we can get to our goal! Visit our hay fundraiser page and click on the social media icons on the bottom of the donation form to share our page on your social media pages. Suggested copy: "@maplefarmsanctuary desperately needs to buy hay and shavings to keep their rescued animals fed and warm this winter. Can you help by making a gift?" Suggested copy: "@maplefarmsanctuary desperately needs to buy hay and shavings to keep rescued animals like Finn fed and warm this winter. Can you help by making a gift?" Suggested copy: " @maplefarmsanctuary desperately needs to buy hay and shavings to keep rescued animals like Chewie, Pumpkin, and Yoda fed and warm this winter. Can you help by making a gift?" Suggested copy: "@maplefarmsanctuary desperately needs to buy hay and shavings to keep rescued animals like Jonathan fed and warm this winter. Can you help by making a gift?" Suggested copy: "@maplefarmsanctuary desperately needs to buy hay and shavings to keep rescued animals like Lorcan fed and warm this winter. Can you help by making a gift?